Welcome to my Technology in Art page, created in conjunction with the exhibit presented by the Spanish Peaks Arts Council (SPACe) in La Veta, Colorado Aug. 29 – Sept. 30, 2017. I have 4 paintings in the show and I explain how technology helped me to create my paintings. 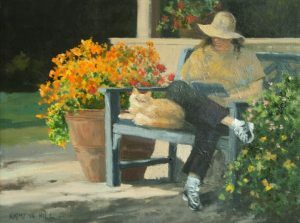 A few years ago, I was inspired to create a painting of flowers that were sunlit, and the bench, in front of the La Veta Public Library. I was never very happy with the results so after it sat in my studio for about 4 years, I decided to add a figure to the bench. 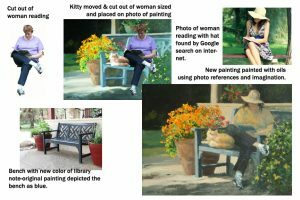 I had taken pictures of a woman sitting on a park bench in the La Veta Town Park, reading a magazine and decided to try to use the photo of her as a model. Thanks to technology which includes a digital camera, computer, inkjet printer and a Photoshop program, I was able to create a new version to paint from. 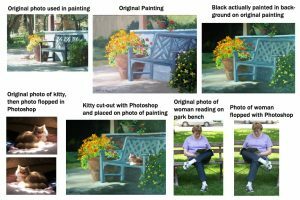 The most difficult aspect was being able to take a photo of a seated woman and placing it on the bench, in the correct proportions. This is where the technology provided by Photo shop is so helpful. The same for the cat. Also, I painted the library with the current color of the building and the bench more like the black that it is. Below I have broken down the steps I took. 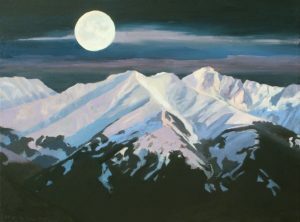 The technology I used to create this painting included the capability to do internet searches for images, save the images, make color changes with Photoshop, and print the new images so I could use the photos as references to paint the moon over the mountains. I started with a stretched canvas with black gesso applied over the factory provided white gesso. I found two images to work with to create the painting. 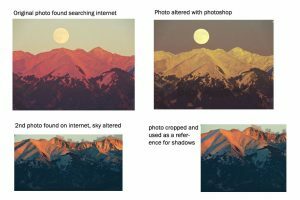 One photo had the moon and the other had shadows that I incorporated into the first photo. 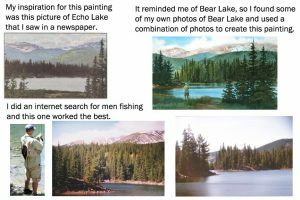 The technology I used in “Bear Lake Fishing” was scanning photos into my computer so I could size and print them out, and cut out portions of the Echo Lake picture to incorporate in the actual Bear Lake photo. 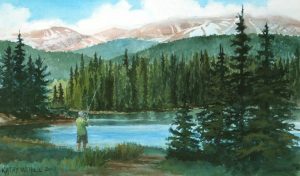 I did an internet search for men fishing so I can add a fisherman to the painting. Thanks to Photoshop, I could print him in different sizes to see which looked best in the painting. 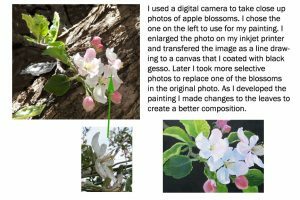 The technology I used to create “Apple Blossoms” included my digital camera, inkjet printer and Photoshop. With a digital camera, I can get really close to the flowers, take numerous photos and be able to see them immediately. Not too long ago, I used an excellent camera to take similar photos but I would have to wait until the film was developed and I had the pictures in my hand to find out if there were any I could use. Another advantage of digital photo technology is that I can load them to my computer and immediately print them whatever size I want. 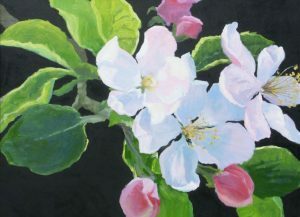 For this painting I chose one photo to work from, but one of the blossoms was hard to make out, so I took more photos, looking for a specific profile. I was lucky I could find blossoms to photograph because we had a freeze that wiped out 75% of my apple blossoms. As I developed the painting, I played with colors and created different leaves.